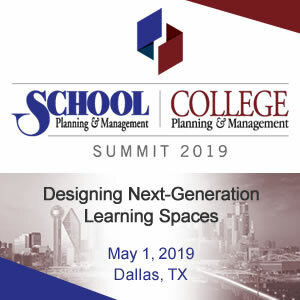 READ | LEARN | CONNECT with institutions, the architectural community, service providers and others interested in creating high-quality facilities. Spaces4Learning brings together a broad array of vital resources and services that keep you abreast of current issues, trends and research; provides you with professional development opportunities; and keeps you connected with those who share a common interest. Established in 1962, School Planning & Management has been a resource for professionals serving the pK-12 education market including members of the architectural community and the school district team charged with planning, designing, constructing, equipping, operating and maintaining the physical learning environment. Editorial features practitioner-based articles, topical supplements and special reports that focus on Facilities, Safety & Security, Technology, Business and Finance, and the Learning Environment. Established in 1998, College Planning & Management has been a resource for professionals serving the 2-year and 4-year college/university market including members of the architectural community and those at colleges and universities who are charged with planning, designing, constructing, equipping, operating and maintaining the physical learning environment. Editorial features practitioner-based articles, topical supplements and special reports that focus on Facilities, Safety & Security, Technology, Business and Finance, and the Campus Scene. Education Marketplace is the online resource for products, services and suppliers for the pK-12 and college/university market. From facilities, to furniture and equipment, to security, technology and more – this interactive buyers’ guide makes it easy to find the products and services that will best meet your needs. Also distributed in print. Education Design Showcase is an online gallery of innovative solutions and inspiring designs for education. Designed to be a site for sharing innovative, yet practical, solutions in planning, design and construction, this interactive tool allows you to search and select based on extensive project information including project size, cost, location, funding method, delivery method, sustainability, development team and more.